My daughter and I have having so much fun creating Thanksgiving Day crafts. I found another fun craft that transforms a white plastic spoon into a turkey. All you need for this craft is construction paper, glue, a white spoon and a black sharpie marker. I am always looking for fun crafts to do with my daughter. This time of the year we try to make our crafts relate to the holidays. 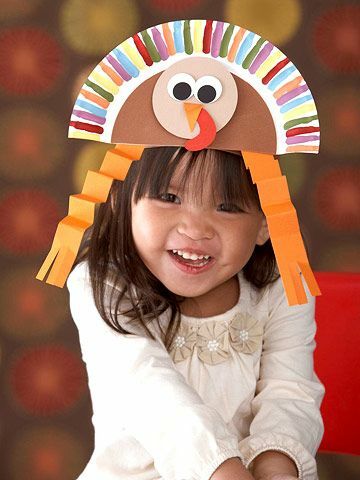 When I found this cute Turkey Hat on Pinterest from Parents magazine, I knew my daughter was going to love creating this festive hat. I happen to have all the items required to create this fun hat, so there was no cost. I'm always looking for crafts that do not require me to spend any money or bring anymore supplies into our already cramped house. All you need is a paper plate, construction paper, crayons or paint, scissors and a glue stick. We had so much fun creating this hat. Probably will be creating these again next year. If you have been following my blog, you'll know that we are going through a pretty major renovation to expand our bedrooms to give our family more room. If not, here is a link to the latest post about our renovation. In the process we are also redoing our bedroom, the only room in the house that we have not touched since moving into our home. 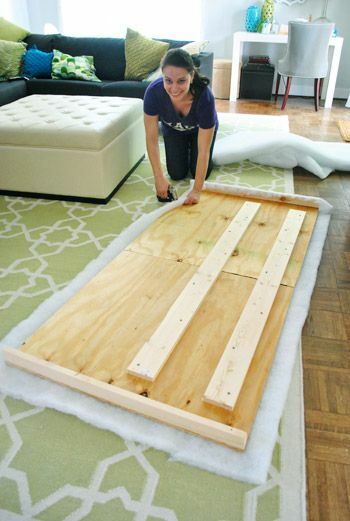 One of the projects that I have been wanting to tackle for a while now is to create a custom headboard for our bed. We have never had a headboard in our adult lives so this is very exciting. 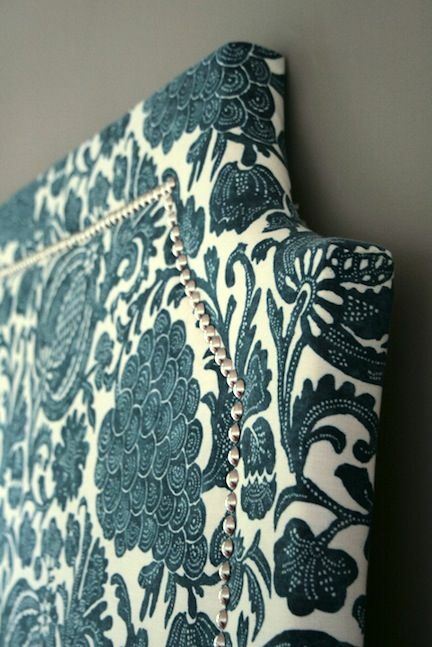 I went on Pinterest to get some ideas about how to create a simple, inexpensive padded headboard. There was plenty of inspiration to be had. In the end our design most closely resembled the design of Deming Design Studios headboard. My husband went to home depot and had them cut a piece of 3/4" plywood to the correct size. Then we cut a 2x4 to fit across the top of the board, this way when we cut the 2x4s for the legs they would be easier to get level. We sprayed the bottom of the legs black so that they would blend in wtih the frame. 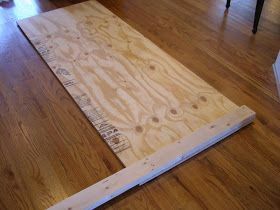 Once the frame was built (my Mom and Dad helped with this whole process) we stapled four layers of extra loft batting to the frame. I got two packages of extra loft batting from Joann's fabric. The top corners were a bit tricky, because of the amount of extra batting that gathered there. What we ended up doing was cutting down the middle of the flap, then we cut off some of the extra batting and folded the other side over and stapled it to the 2x4. My daughter was having a great time with this project, she really loved how soft the batting felt. I got the brown fabric from Zimmans, a upholstery fabric store north of Boston. They have a great selection of discounted remnants in their basement that could keep you busy for days just looking through everything. We attached the headboard to the bed frame by drilling holes in the legs and using bolts to secure the legs to the frame. This whole project took about half a day to complete, but so worth it. I have to thank my Mom again for all her help with this project. I'm always looking for fun crafts to do with my 2 year old daughter. 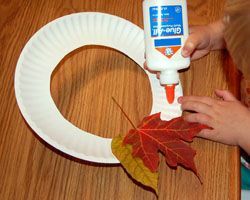 I came across this cute project to make wreaths out of fallen leaves. This was pinned from Crafts for all Seasons. This was a relatively cheap craft too. All we needed was paper plates ($2-$4), leaves (free), glue ($2) and scissors.